Adding the web's #1 shopping cart software to your web site is easy! You can sell one simple product or offer an entire product catalog, with any number of product options. After signing up, you will log in to the web Shopping Cart Administration Area and adjust your shopping cart's payment options, shipping methods, sales tax, discounts, colors, along with a host of other customizable features. After updating your internet shopping cart settings, you will enter information about each product you sell on your web site, such as the product name, description and price. You can also upload all of your product data at once. This can be a challenge with other shopping carts but we make it easy with our Product Import tool. Add a link (we provide) to your website. You can label the link "Store," "Products" or any name you wish. Your customers will click on the link to shop at your online store. Create your own product pages by cutting and pasting product HTML code to your website. 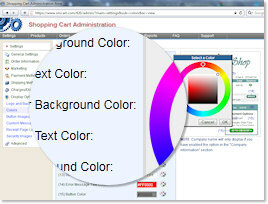 We provide each product's HTML code to you in the shopping cart administration area. No matter which method you use to link our web site shopping cart to your web site, your customers will be able to add items to their shopping cart and securely checkout to pay. This is a quick overview on how to set up our electronic commerce shopping cart with your website. There are a variety of optionl features to choose from. For example, if you sold shirts, inventory can be tracked on groups of options (e.g., blue, medium shirts tracked separately from green, large shirts). Product options can also add to the price of the product (e.g., Add $2 for x-large) and they're a great tool for up-selling! Check out our online shopping cart software demo to see what our product can do for you. © 1997 SecureNetShop.com, LLC. All rights reserved.